This month at Melting Pot Café, it’s a celebration of sumptuous Nyonya cuisine at Concorde Hotel Kuala Lumpur. Nyonya cuisine has always been renowned for exceptional balance of robust flavours from its amalgamation of Chinese and Malay heritage. The used of spices coupled with the tedious preparations that goes into the cuisine highlight the complexity and effort that goes into the cuisine. 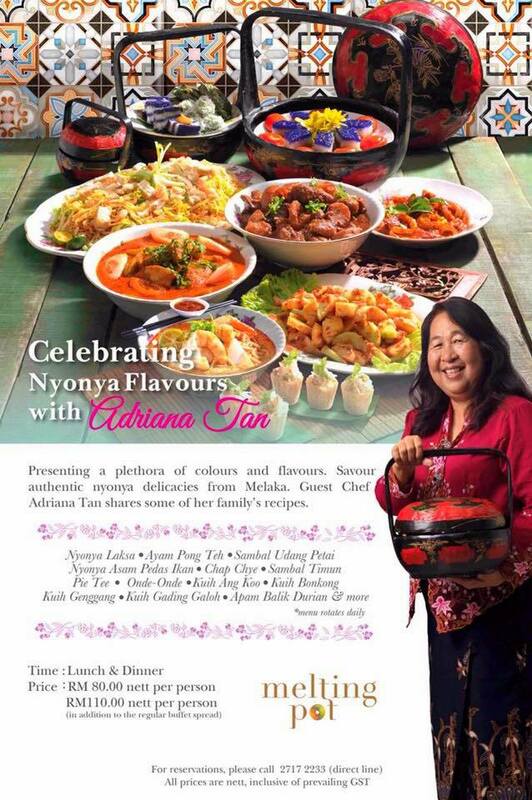 From March 6 to March 26, 2017, savor a tantalizing spread of Nyonya dishes by Adriana Tan and her husband as well as Asian and international delights at Melting Pot Café. Guest Chef Adriana was born and raised in Bukit Baru, Melaka. Passionate about cooking, she began cooking from her teens and has a small catering business ‘Adriana Nyonya Delights’ that she and her husband, Ng Joon Tai, runs from their current home in Ayer Keroh, Melaka. They have been catering to special occasions from small parties to bigger functions including corporate events. We’ve been told she and her husband both once catered to over 500 people in a corporate function on their own. Chef Adriana’s homecooked meals are a big hit among her regular family, friends and customers in Melaka, Kuala Lumpur and Singapore. Her list of Melaka Nyonya cuisine includes Nyonya Laksa, Mee Siam, Ayam Pong Teh and a kaleidoscope of colorful and delicious classic Nyonya kuih. Don’t miss the gorgeous spread of colorful Nyonya cuisine at Melting Pot Café this month. Diners should start off with Chef Adriana’s signature Nyonya Laksa that she makes daily from spices and seafood. She generously shares her secret to her Nyonya Laksa by adding kerisik to boost up the flavours of the spices as well as to thicken the curry. Served with yellow noodles, the luscious creamy curry also has squid, prawn, fish ball and beancurd cooked into the laksa gravy to add seafood flavours to it. Savor this bowl with the chef’s thick chili sambal and a squeeze of calamansi lime. Needless to say, the Nyonya Laksa is indeed sublime. Beautiful robust flavours of spices with hints of seafood essence and lots of deep rich coconut notes summarized the laksa. Besides the laksa, there’s also Mee Siam. Chef Adriana makes everything from scratch. She pounds her spices for the Mee Siam gravy and cooks it till its well balance with savory and sweet. Her rice noodles are served quite simple with bean sprout and egg omelette strips as she prefers to let the flavours of the sauce shines. Pai Tee, little crispy tophats of pastry shells filled with cooked yambeans and other vegetables with a smudge of chili, is simply a must-try from this buffet. There’s also Sambal Timun and Sambal Mangga to whet the appetite for more Nyonya dishes to try. Nyonya cuisine comprises of steamed rice served with a list of main dishes that includes curries, stews, soups, grilled or sautéed dishes. Every dish is unique with bold flavours that somehow works well together. In this buffet, diners are treated to signatures of Chicken Pong Teh, Asam Pedas Tenggiri with Peria, Sambal Udang Petai, Ayam Tempra, Kari Ayam Kapitan, Ikan Bakar Gerang Asam, Ketam Bercili, Chap Chye, Telur Cincaluk Kukus and more. The Ayam Pong Teh is delicious! A chicken stew cooked with tauchu or fermented soy beans with gula Melaka, the version here is beautifully balance and not overly sweet. The chicken was tender while the potatoes are soft and creamy, all beautifully soaked up with the flavours of the sauce. Ayam Tempra, another dish that utilizes lots of onions for sweetness, soy sauce for savory, calamansi lime for sourness and hints of heat from chili, is easy to enjoy. For those who love sourish and piquant flavours, there’s Asam Pedas Tenggiri with Peria. Thick cuts of mackerel cooked in tangy piquant curry gravy are quite addictive and makes one want to pile on more steamed rice. Chef Adriana adds bittergourd to her recipe for the subtle hints of the bittersweet vegetable. The Ketam Bercili was a big hit with many that evening including myself. Flower crabs cooked in spiced up dry curry was a firework of flavours in the mouth. The balance of spices and heat was just right, allowing the natural sweetness of the crab to come through. A must-try! There’s also Ayam Kapitan curry as well as a tasty Sambal Udang Petai to pile on to your rice. Ikan Bakar Gerang Asam, Chap Chye, Telur Cincaluk Kukus and more are also expected to be in the buffet on rotation daily. Besides Nyonya dishes, there are also lots of other international dishes such as Seafood on Ice, Grilled Seafood Stations, local and Western dishes as well as soups and salad. While it may be quite a task to not fill up on all those scrumptious main dishes with rice, one simply must try to save room for Chef Adriana’s desserts of Nyonya Kuih. The list is quite mind-boggling with Abok Abok Sago, Kuih Abu Sago, Apam Balik Durian, Pulut Tekan & Kaya, Onde Onde, Rempah Udang, Kuih Bongkong, Kuih Seri Muka, Kuih Kosui Pandan and Kuih Kosui Gula Melaka, Ang Koo Hitam, Ang Koo Merah, Putugal and more. 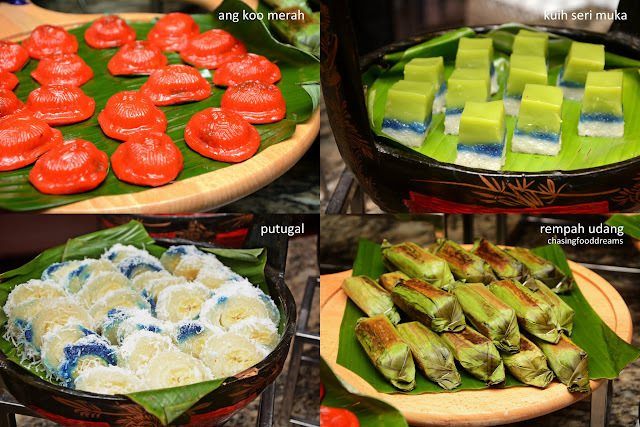 These Assorted Nyonya Kuih are all made fresh daily by Chef Adriana. 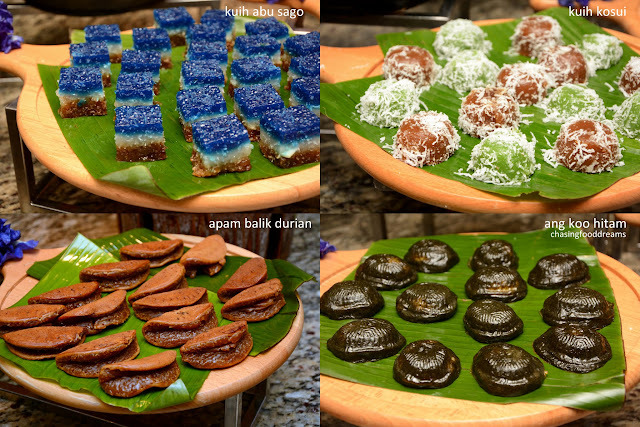 Not only does her kuih taste yummy, her kuihs have gorgeous colors, most made using natural flowers and leaves for color extraction. 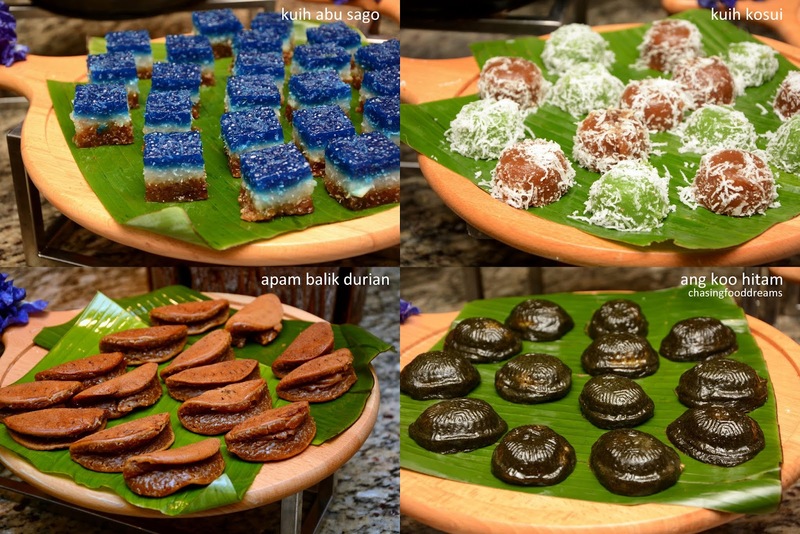 Her Kuih Abu Sago, Rempah Udang and Pulut Tekan uses the bunga telang for its vibrant blue hues. Her Ang Koo Hitam uses dried daun ramai for its dark green while the Kuih Seri Muka, Kuih Kosui Pandan and Onde Onde uses pandan leaves. Nyonya kuihs are tedious treats of sweetness. The balance of flavours and textures are very important and more of them requires layers of different batters and ingredients to be amalgamated in harmonious way. 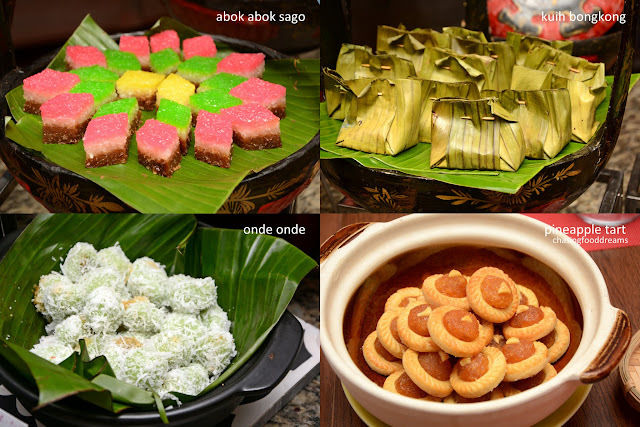 Don’t miss out on the kaleidoscope of Chef Adriana’s Nyonya kuihs in this buffet! wow all the pictures of the foods are telling they are so much delicious ! The beauty of the space and food get 5 juicy stars. The place was built with class! I'm no critic, but this place makes you appreciate design and aesthetics. I went to two events at San Francisco venues. Both times, I had a great experience.